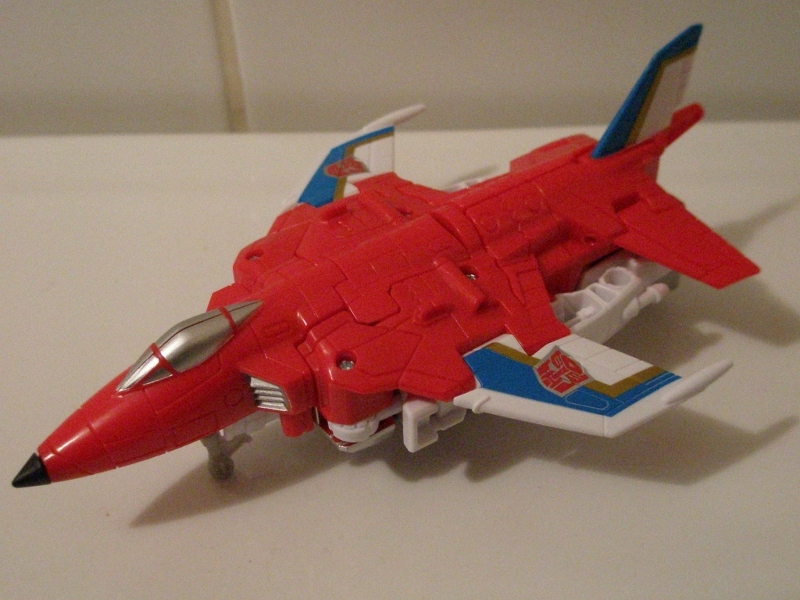 Bio: If Aerialbots needed pilots licenses, he'd never have got his. A hazard in the skies, Firefly pays no attention to where he's going since he's too busy marvelling at the scenery. Flies at Mach 2.0 with a range of 1,000 miles. Firefly carries flammable 'fire-fog' missiles, uses a photon displacer gun that affects sight by distorting light waves. 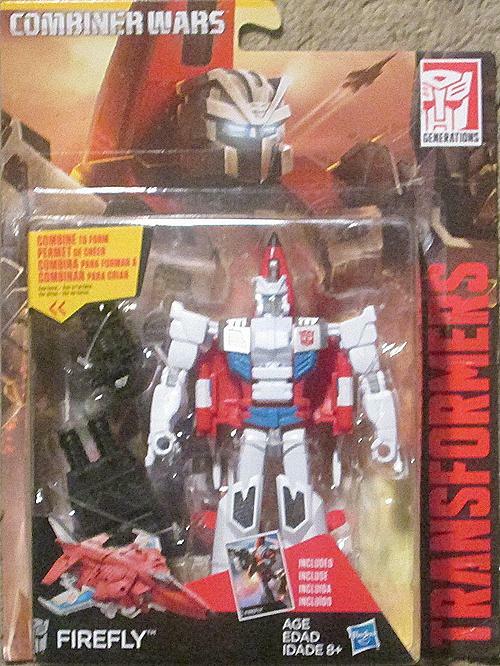 With his fellow Aerialbots, Firefly forms the giant robot known as Superion. Proper Gestalts! Finally. Its been a long and torturous route to Combiner Wars. Between them, Hasbro and Takara had a fantastic grasp of how to make combiners work and then, sometime around 2004's Energon line, it all went to pot as the formula was tinkered with. What should have been a centre-piece toy for the 2009 Revenge Of The Fallen toyline - Devastator - was instead an embarrassing Supreme Class jumble of Tonka toys. A smaller Legends Class figure turned up later, which was better, but c'mon � piddly Legends toys? 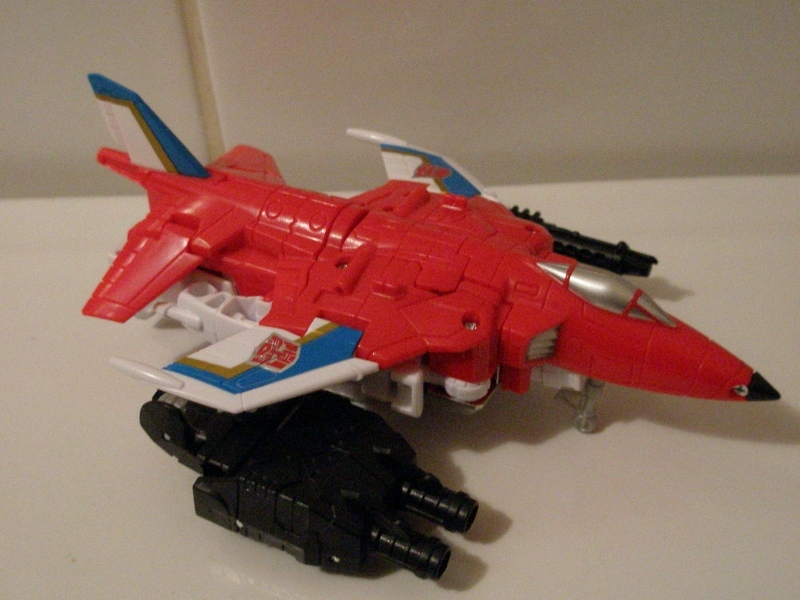 After that, we got the mediocre Powercore Combiners, featuring a Scout Class toy that could convert to a torso and clamp on a variety of auto-morphing Drone vehicles (all of which Fandom gave a collective snort at � until the Dinobot one came out). Following on from these engineering cul-de-sacs was 2012's Fall Of Cybertron Bruticus. This chap saw a return to Special Teams style engineering, but somehow fell foul of budgetary restrictions that robbed the toy of any quality, leaving consumers with an extremely wibbly and gossamer thin stretch of plastic. For Bruticus. Who should be a frickin' fatty bruiser! Lastly, and by some means leastly, Transformers : Prime's Beast Hunters sub-line gave us another Legends combiner in the shape of Abominus, whom was also terrible, despite being made out of five fairly decent little robots. The key thing that's hobbled all combiner Transformers since 2001's Robots In Disguise is this desire to stick to the five robot formula, but with an unwillingness to properly finance the things from design to final piece which has lead to all kinds of horrible mal-formed gestalts that look like they've got some crippling wasting disease. So it is then, that Hasbro have gone back to the drawing board. Or 1986. Yes, there's no disguising it, 2015's Combiner Wars just takes the Special Teams (or Scramble City) blueprint and updates it for the twenty-first century. As with Generations Springer, you can't help but wonder if the proliferation of Third Party bootleggers turning out impressive and some would say superior product (especially where gestalts are concerned) has been a factor in Hasbro's thinking. I had my head turned by the Combiner Wars toys whilst out Christmas shopping and spotted the first wave of figures in Smyths. Which means the UK scored another coup getting in the product before most other places, although oddly there's not been the usual wailing and gnashing of teeth from US fans this time around, like there was for the two weeks the UK had Transformers : Prime stock before them. Perhaps some folk had learnt that paying up to �150 in online auctions for a deluxe toy that would arrive soon enough in their own territory wasn't worth it. Not even for bragging rights - �You paid how much?!�. 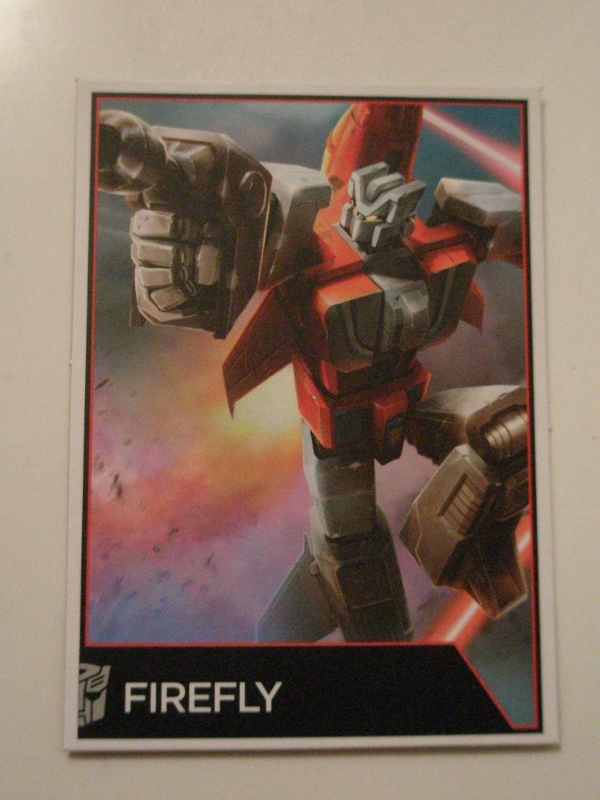 Firefly...ght here and Drag Strip were my first purchases, and its definitely Firefly* whom impresses. *Name changed for exciting trademark reasons. Robot Mode: I thought Firefly's robot mode was something quite fresh and unique, it looks so slick and awesome, but no. It's actually a superb update of the original toy's design. Okay, the chest has been tinkered with a bit and displays some characterful asymmetry what with an Autoboob to the left and a vent to the right of his chest, but otherwise he's pretty much bang on what the '80s toy did. 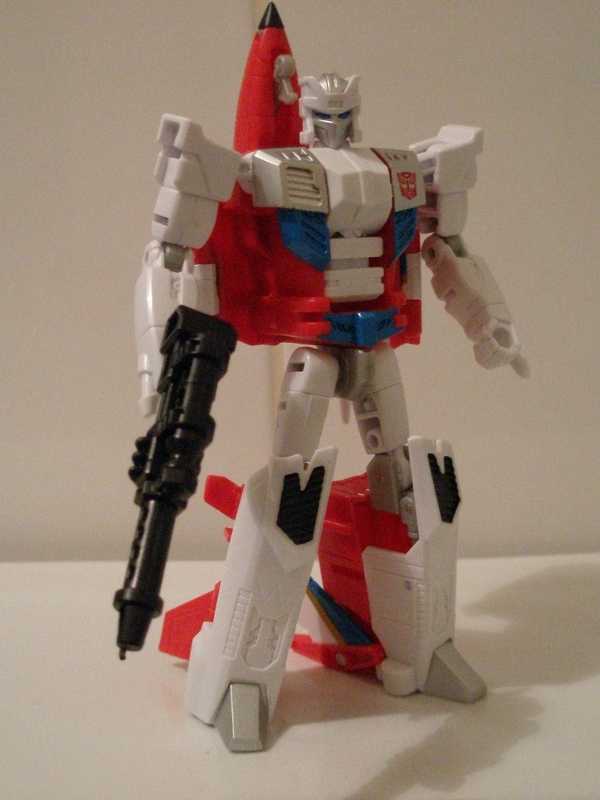 Which just goes to show how little impact the Aerialbots original toys made on me in robot mode. Whilst the jet alt modes were fairly distinctive, the robot modes for each of the original limb-bots were fairly forgettable. What today's design and engineering brings � not mention a huge increase in size � is a broader palette in which to flesh out these neat little design touches. The legs are nicely shaped, with these handsome silver toes slightly offset to allow for a cool pose or ten. The arms have these nice shoulder pads with these great wing- like flourishes and his forearms are these taut little fellas with some additional moulded Seeker-style ray guns. Top that off with this incredible looking bonce and Firefly is hot to trot. What makes him all the more glorious though is fantastic colour placement. Predominantly red and white, he throws in some nice electric blues and some thoughtful daubs of silver and even a bit of black which really help this stop being the sort of bland out that hobbled the likes of the otherwise excellent Transformers : Prime Ratchet toy. Alternate Mode: Check out this cute red block! Firefly is a nice chunky take on a Harrier Jump jet (er, it says here). It looks nice and slick in its largely red redness and feels nice and solid. He carries over the livery from his original incarnation, with the nice swipes of blue and yellowy gold banding. The cockpit is done in silver and he has a tough rubber tipped nosecone � for safety. Which suggests that the amount of people whom have suffered toy plane nosecone related injuries over the last 50 years must have reached epidemic proportions. Sometimes I wonder how I survived playing with toys as a child. And a teenager. And a grown up. The underside of the jet suffers the same problem as all jet based Transformers since time immemorial � that of being an embarrassment of poorly concealed robot giblets. 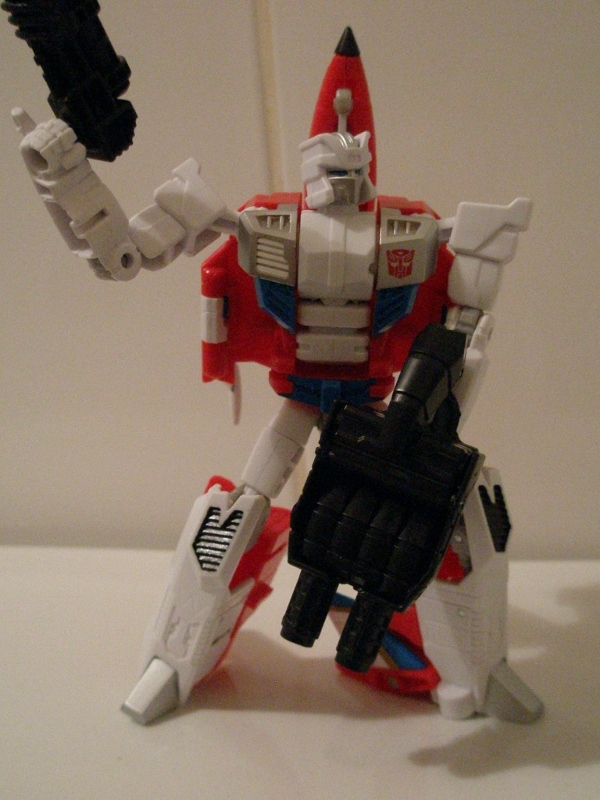 I don't mind though � I've had 30 years of Transformers toys to get used to this. Your tastes may vary. There's some landing gear chucked in � but only the front wheel. For the rear, he perches on his toes. Usual stuff then, but not bad. Not bad at all.